The detached single family house, once the symbolic keystone of solid American values, is not infallible. The 2008 – 2009 national foreclosure crisis has left single family homes blighted, creating landscapes of waste and abandonment. 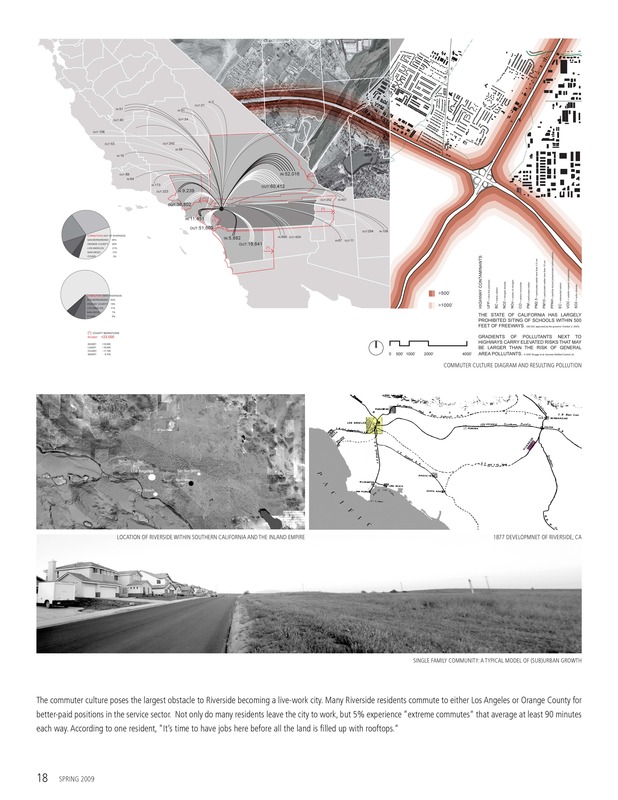 Riverside, at the geographic center of the Inland Empire in Southern California, emerges as one of the most affected regions. Commonly assumed to be an extended suburb of rapidly growing Los Angeles fifty miles west, Riverside has an independent history and has struggled to retain an autonomous character. 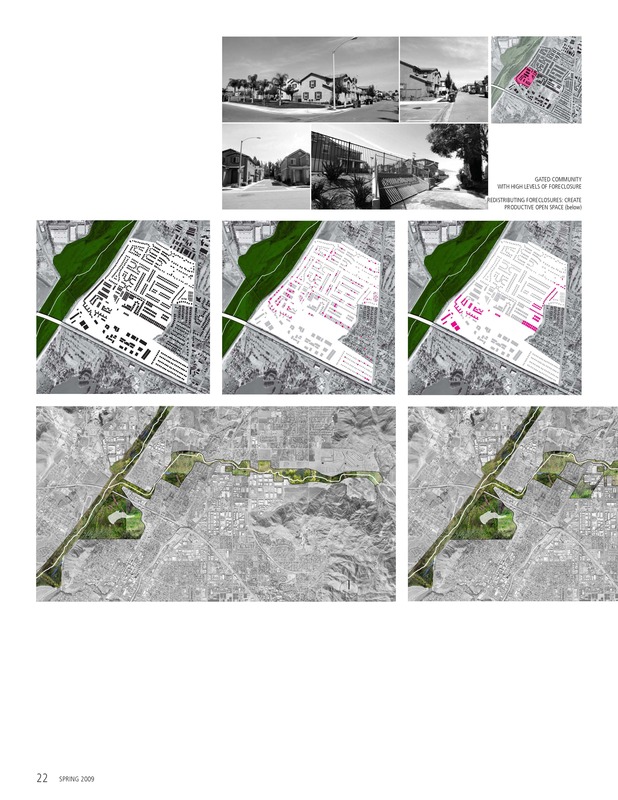 The project aims towards restoring Riverside’s identity by intelligently using the city’s natural assets; accordingly, the foreclosure crisis provides a point of economic and spatial schism used to change the current trajectory of the city’s development. 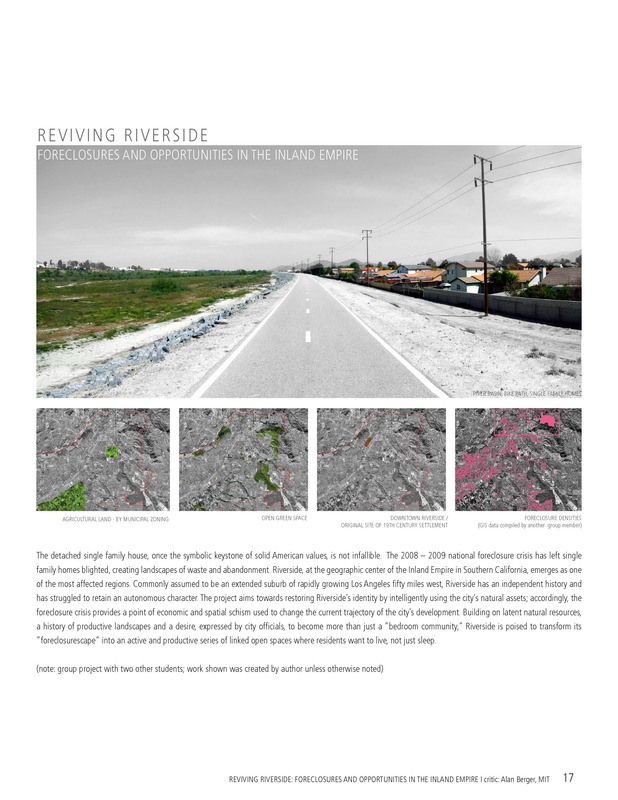 Building on latent natural resources, a history of productive landscapes and a desire, expressed by city officials, to become more than just a “bedroom community,” Riverside is poised to transform its “foreclosurescape” into an active and productive series of linked open spaces where residents want to live, not just sleep. An opportunity for a system of open space lies in the arroyos that run throughout Riverside. These channelized water ‘structures’ have only been accorded the functional use of capturing water during heavy rains. We believe in the potential of going beyond an integration scheme for the arroyos by investing them with the agency to drive future development. 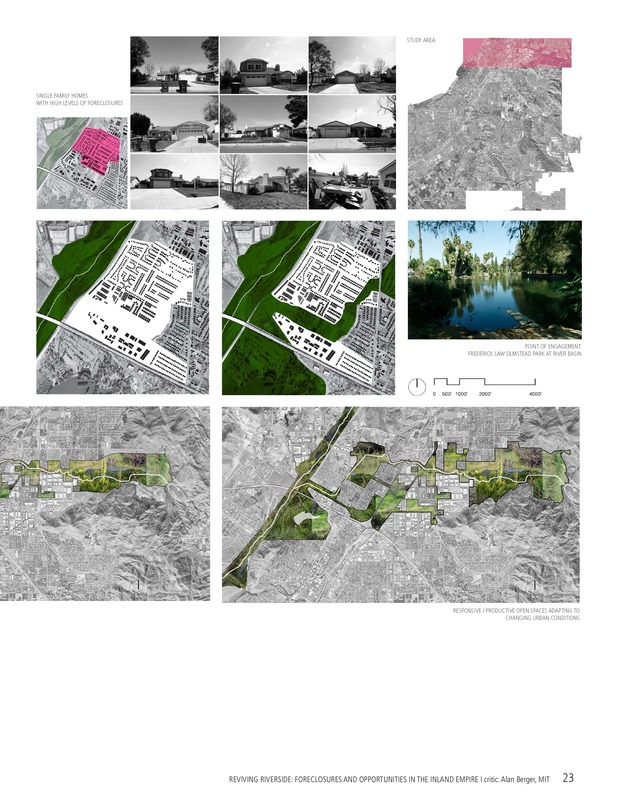 The project seeks to capitalize on the current foreclosurescape as an opportunity to introduce a linear, integrated and productive system of open spaces. This system would be spatially organized via Riverside’s arroyos. 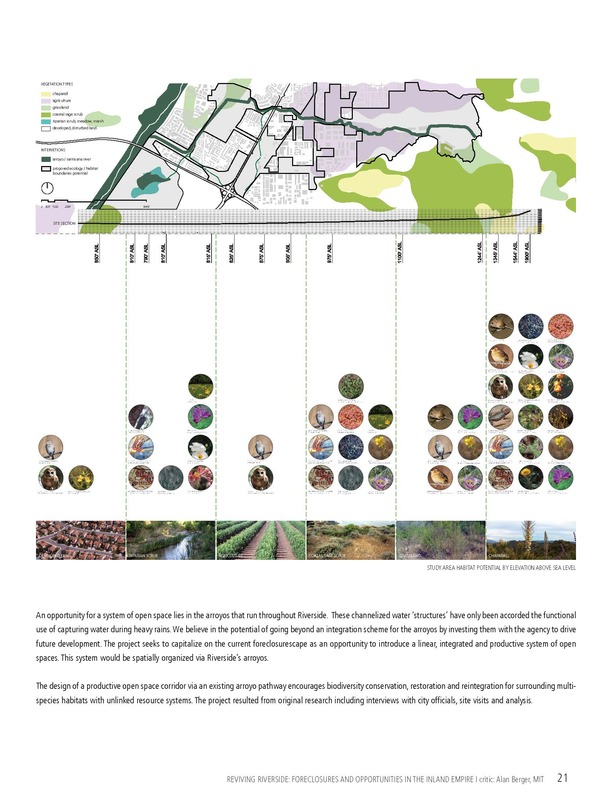 The design of a productive open space corridor via an existing arroyo pathway encourages biodiversity conservation, restoration and reintegration for surrounding multi-species habitats with unlinked resource systems. 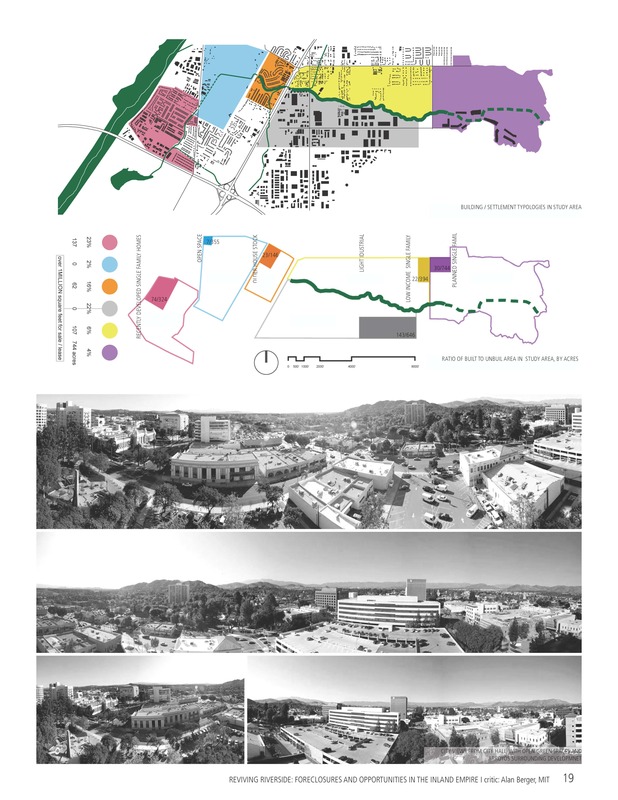 The project resulted from original research including interviews with city officials, site visits and analysis.